Permanently bond items to paper, cardboard, foam board, display board, and more with the non-toxic adhesive of Elmer's All Purpose Glue Sticks. Permanently bond items to paper, cardboard, foam board, display board, and more with Elmer's All Purpose Glue Sticks. Specially formulated to be easy to use and clean up, Elmer's All Purpose Glue Sticks are perfect for arts, crafts, and school projects. 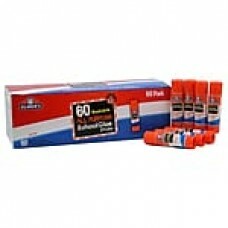 Elmer's All Purpose Glue Sticks apply smoothly and dry quickly, giving you reliable results with every use. They are washable, acid-free, photo safe, and non-toxic.